Bahrain’s capital in the 19th century, Muharraq is the third largest city and is the country’s Capital of Islamic Culture 2018 courtesy its rich heritage. 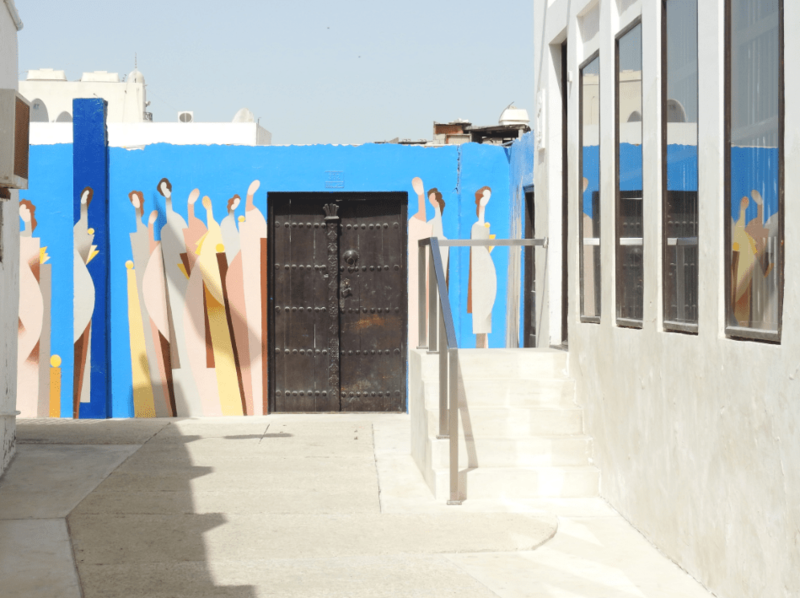 Being a heritage and culture aficionado, I was looking forward to explore Muharraq as it is a city that has managed to retain an old world charm thanks to large scale conservation efforts. 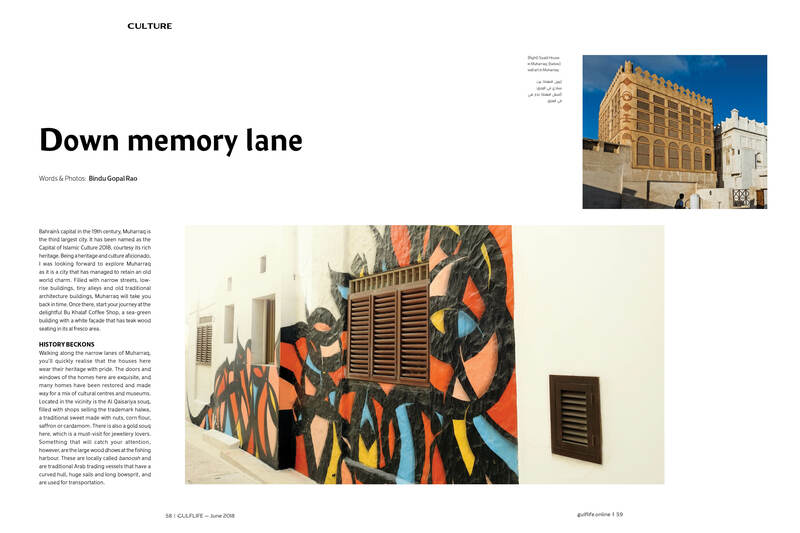 Filled with narrow streets, low-rise buildings, tiny alleys, old traditional Arab-Gulf architecture buildings, Muharraq will take you back in time. I start my journey at the delightful Bu Khalaf Coffee Shop a sea green building with a white façade that has teak wood seating in its al fresco area and seems straight out of a fairy tale. Heading into the adjoining lane, my guide Zahara tells me that this used to be a small town until the ruling family settled here in 1810. Walking along the narrow lanes here I quickly realize that the houses here still wear their past heritage with pride. The doors and windows of the homes here are exquisite and my guide tells me that it is quite expensive to replicate these doors in modern homes. Most homes have been restored and have made way for an eclectic mix of cultural centres, museums and boutique hotels. Located in the vicinity is the Al Qaisariya souk filled with shops selling the trademark halwa, a traditional sweet made with nuts, corn flour, saffron or cardamom. 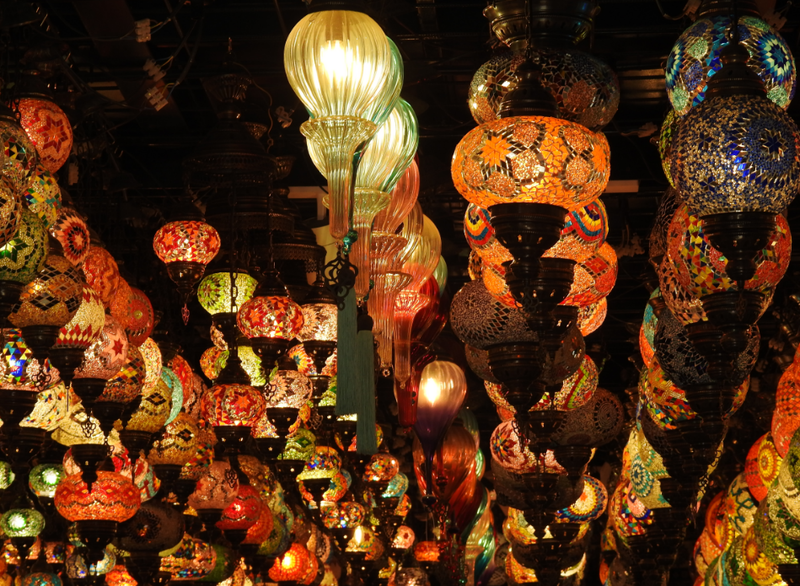 There is also a gold souk here a must visit for jewellery lovers. Something that caught my attention however were the large wood boats at the fishing harbor. These are locally called dhows and are traditional Arab trading vessels hat have a curved hull, huge sails and long bowsprit and are used for transportation. When in Muharraq, a stop at the Sheikh Isa bin Ali House is a must as this is easily the finest example of Gulf Islamic architecture. The house has intricately carved wooden doors, four courtyards around which all the rooms are built, geometric patterned windows and perforated gypsum panels. The wind towers here are characteristic and allow for natural ventilation. This house belonged to the monarch who ruled between 1869 and 1932 and this was both his home and seat of government. 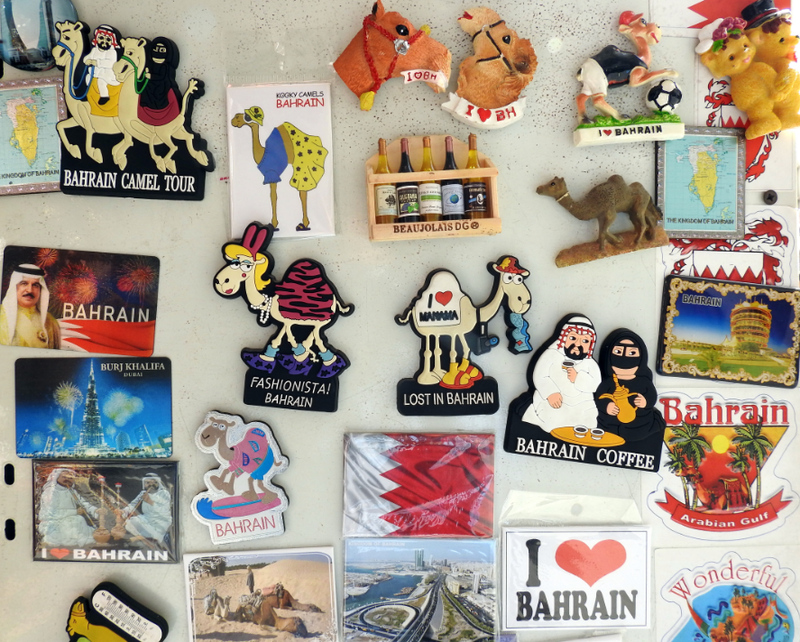 The Sheikh Ebrahim Bin Mohamed Al Khalifa Center for Culture and Research is another must see as it gives interesting insights into Bahrain’s heritage. 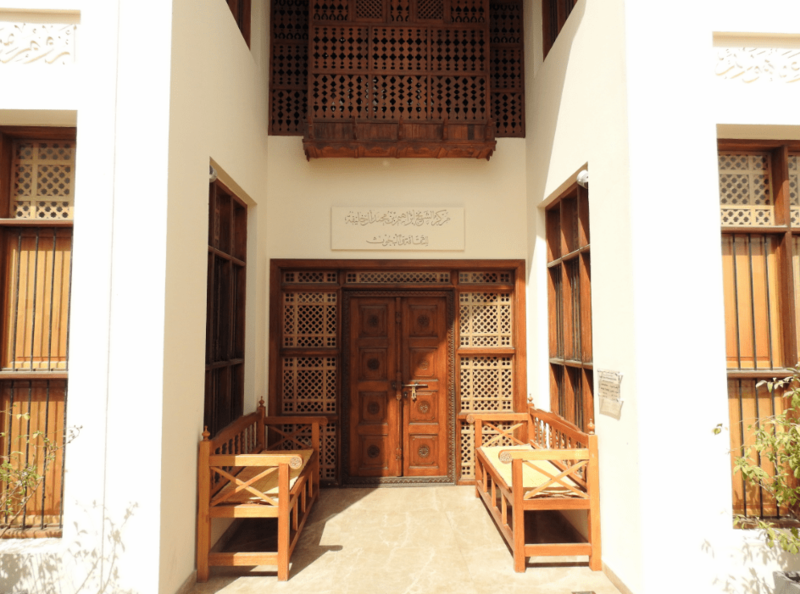 The Kurar House showcases the traditional embroidery of the country while Bahrain’s pearling history can be seen at the Bin Matar House that was once the residence of a renowned pearl merchant. A space for artists, speakers, philosophers and poets to exchange knowledge and ideas, this place has a large auditorium as well. 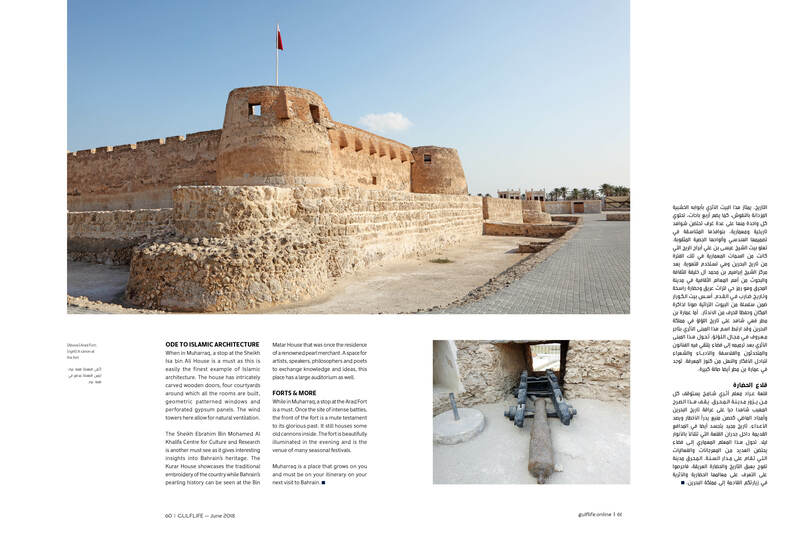 While in Muharraq a stop at the Arad fort a typical example of Omani military architecture dating back to the start of the 16th century is a must. Strategically located as a sea passage, even today you can see the water front filled with migratory birds from the outside of the fort. Once the site of many intense battles, Arad fort today as it stands today was restored in the 1980’s using authentic material. The cream façade of the exterior is a mute testament to its glorious past and inside you can see some old canons and also climb up to the next level that gives you a bird’s eye view of the island. By evening, the fort is beautifully illuminated and is the venue of many seasonal festivals through the year. Another important museum is the Bait al Quran or House of Quran a building engraved with Arabic script that is a museum with an amazing collection of Quranic manuscripts. It also houses a library with over 50,000 books in Arabic, English and French which mainly focus on Islam. You can see many Qurans here that have been written on different materials like rice, parchment and grains and is said to be the only institute in the world dedicated to the Quran. While photography is not allowed inside, you can still admire the ancient manuscripts dating back to the 7th century. Apart from the museum, the building houses a mosque, an auditorium, a madrasa (religious school) and is an art exhibition venue too. 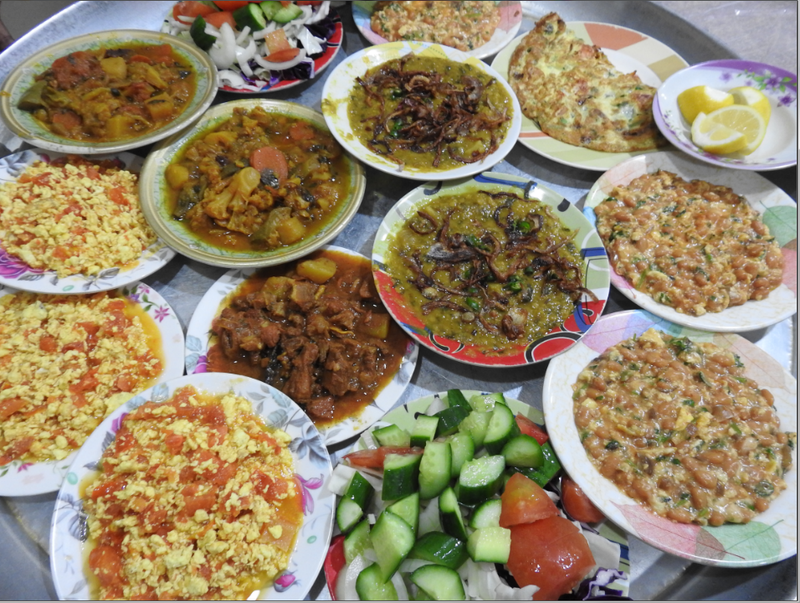 Muharraq is a place that grows on you and must be on your itinerary on your next visit to Bahrain. Muharraq Club is Bahrain’s most successful football club. 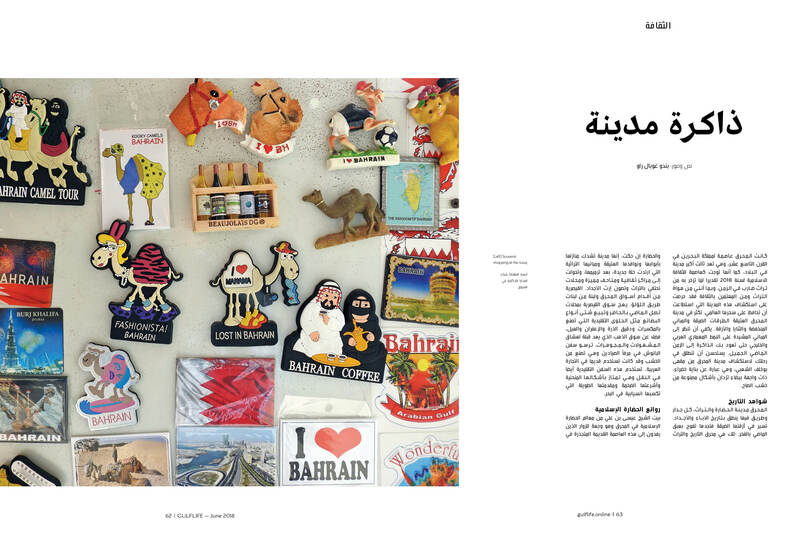 Muharraq is home to traditional arts and music and Ali B a successful Bahraini singer is from here.